Although everyone knows that seawater is salty, few know that even small variations in ocean surface salinity (i.e., concentration of dissolved salts) can have dramatic effects on the water cycle and ocean circulation. Surface winds drive currents in the upper ocean. Deep below the surface, however, ocean circulation is primarily driven by changes in seawater density, which is determined by salinity and temperature. The ocean stores more heat in the uppermost three meters than the entire atmosphere. Thus density-controlled circulation is a key to transporting heat in the ocean and maintaining Earth's climate. Global understanding of ocean surface salinity was difficult because sampling by ships, buoys, drifters, and moorings was extremely limited. So, the need for salinity estimate is global. Unfortunately, salinity's relationship to temperature and to other observables varies from region to region. Thus, the task of developing capability for estimating salinity must be approached region by region. This paper focuses on the Eastern Mediterranean Sea as one such region. Dr. Maged M.A. 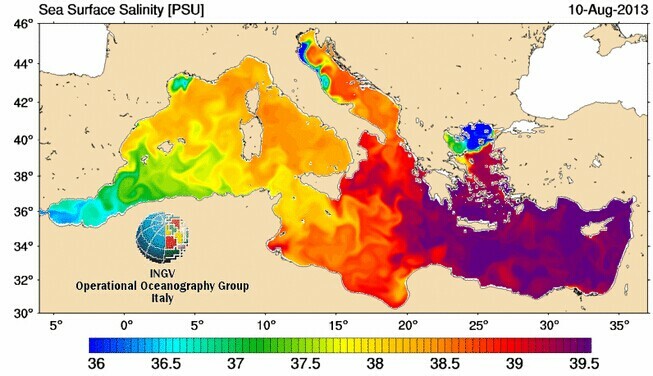 Hussein developed about eight regression models to estimate salinity profiles in the upper 500m from temperature profile measurements, sea surface salinity (SS), Latitude, Longitude and Julian day. 465 Temperature and salinity profiles have been selected for this study. The most powerful model was carried out by a hybrid between two regression models, model 5 for upper 130m and model 8 for the rest depths. 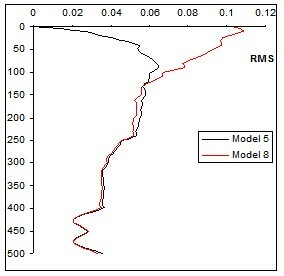 Root mean square errors (RMSE) were computed between the estimated and measured salinities for the verification profiles for all models. The power of these two hybrid models are coming from, each one can be stand alone and apply to get salinity profile with different accuracy. If you have SS and the other mentioned parameters you can apply model 5 with high efficiency to estimate salinity profile (especially for upper 130m). But if SS not available, you can use model 8 with low accuracy than model 5 for upper 130m and more accurate than model 5 for rest depths. Dr. Maged M.A. Hussein, Associated Professor, Marine Physics Lab, Division of Marine Environment, National Institute of Oceanography and Fisheries, Alexandria, Egypt.